Banh ngai (wormwood cake) is one of famous specialties of Lang Son’s Tay ethnic group. This popular dish leaves an impression on any traveller visiting the province. Like banh day (round cake) of the Kinh (majority) people in the plain, ngai cake is also round in shape. It contains rich cultural value and the spirit of the group, said Lang Son elder Nong Thi Bang. Bang said wormwood is a kind of wild vegetable now planted by farmers. It can be used to treat with many ailments such as muscle pains, abdominal pain, back pain, low blood circulation, upset stomach and fever. “It is particularly healthy and nutritious for pregnant woman,” she said. There are many tasty dishes cooked from wormwood. 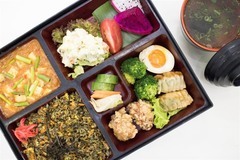 They include wormwood with eggs or chicken, hotpot and the cakes. The cake’s ingredients include special glutinous rice (or khau pay in Tay language) which is fragrant and only planted in the province. 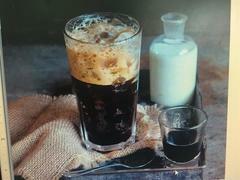 It also has sesame and sugar cane locally known as duong phen that is often packed in a rectangle shape. 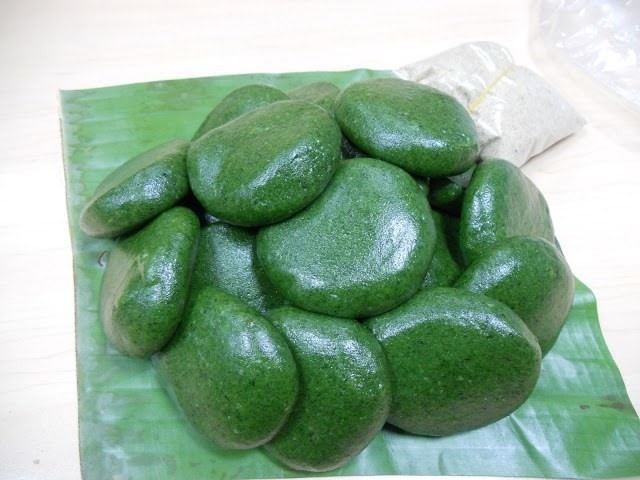 Sweet green: Fragrant and tasty banh ngai impress locals and travellers to Lang Son Province. 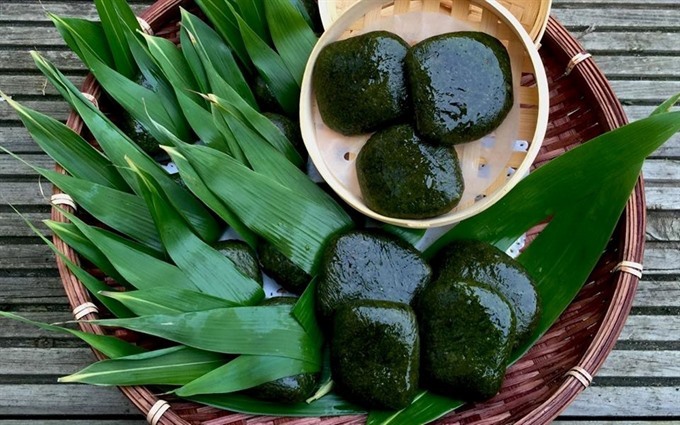 Although these materials are available in the province, Bang said making tasty ngai cake requires carefully chosen fresh wormwood, quality glutinous rice and light yellow phen sugar. “When making the cake, Tay people often send all of their sentiments and wishes into the cake because it is to be used at important events such as worshiping ancestors during the Tet holiday or celebrating a new rice crop,” she said, noting that locals believed delicious ngai cakes would bring health and luck year round. The most difficult thing about making the cake is ensuring the wormwood keeps its green colour without becoming bitter. 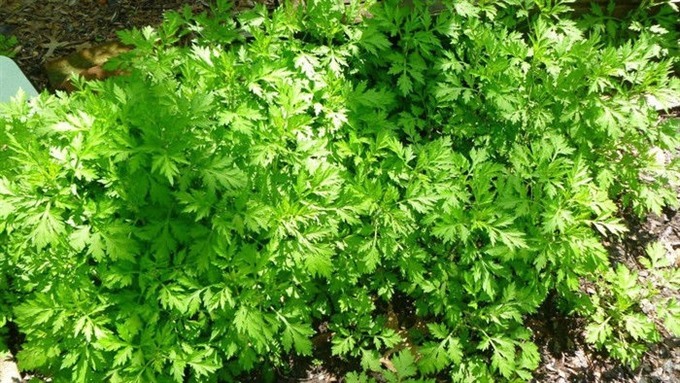 There are two ways to deal with wormwood: boil it in lime water or ash water. “We often use the first way for its simplicity but several elderly people in my village use the second way by using bamboo ash water to make the cake more fragrant with an aromatic flavor,” Bang said. After boiling for an hour, the leaves should be carefully cleaned, cut into pieces, drained and stirred on a light flame to reduce their bitterness, she said. The glutinous rice should be soaked in water for six to eight hours and drained before cooking to turn it into sticky rice. Finished product: A bamboo tray of banh ngai, which are offered to the Tay ethnic group’s ancestors. The dough is kneaded into a small ball and then formed into a round cake which includes condensed ground roasted sesame mixed with yellow phen sugar. The cakes are steamed for five minutes and left to cool. Bang added that it is a very good food for vegetarians. Hanoian Luong Thuy Hoai, who likes to visit Lang Son during winter to enjoy the snow at Mau Son Mountain, said she is very fond of the cake. Hoai said she often bought hundreds of cakes to deliver to relatives and friends as gifts. She also said she bought ingredients from Lang Son to make the cake at home.